Nosler’s line of RDF™ (Reduced Drag Factor) bullets feature very high Ballistic Coefficients, hybrid-type ogives, and tight, factory-closed meplats. Nosler’s RDF bullets were designed to be very competitive match projectiles for their respective bullet weights. Now offered in four calibers, Nosler RDF bullets genuinely deliver excellent performance for the price. Shooters, particular PRS competitors, have found the RDFs deliver the flat trajectory and high BC necessary to reach the podium. 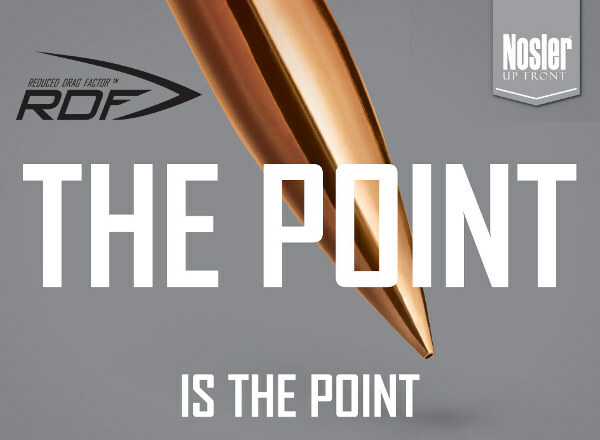 Nosler is proud of its RDF bullets, which feature tight, uniform meplats: “Nosler knows what gives competitive shooters an edge, isn’t an edge at all. It’s a point. With the highest in-class Ballistic Coefficient and smallest, most consistent meplat, RDF is the flattest-shooting match bullet in its class. Now available in more calibers and weights, the RDF’s meticulously-optimized compound ogive and long, drag-reducing boat-tail make achieving peak accuracy a snap”. RDF bullets are also available in Nosler factory ammunition in a variety of popular cartridge types. Nosler factory ammo lets you spend more time at the range and less at your reloading bench. 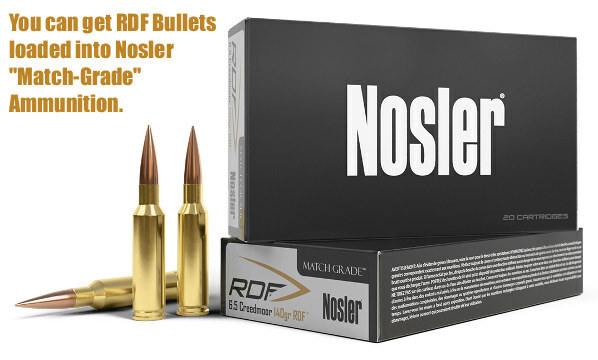 Look for RDF bullets loaded in Nosler’s “Match Grade” Ammunition. Below is the .264-caliber, 140 grain RDF loaded in 6.5 Creedmoor, a popular chambering for PRS and tactical shooters. Share the post "RDF Bullets from Nosler — High BCs and Uniform Meplats"
Want to improve your understanding of Ballistics, Bullet Design, and other shooting-related tech topics? Well here’s a treasure trove of gun expertise. 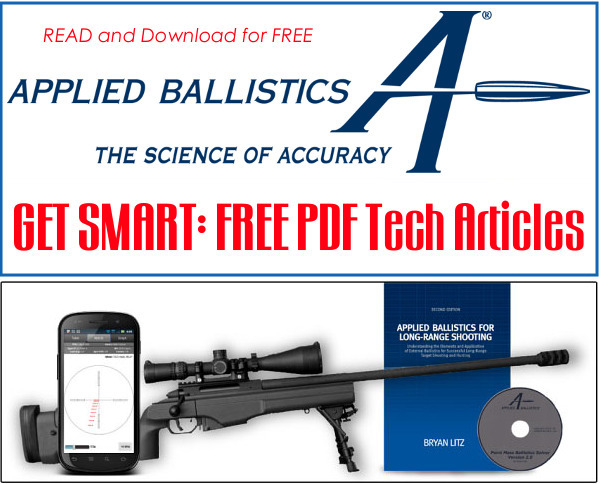 Applied Ballistics offers three dozen FREE tech articles on its website. Curious about Coriolis? — You’ll find answers. Want to understand the difference between G1 and G7 BC? — There’s an article about that. Here are six (6) of our favorite Applied Ballistics articles, available for FREE as PDF files. There are 31 more, all available on the Applied Ballistics Articles Webpage. Share the post "Access FREE Tech Articles from Applied Ballistics"
Here’s a significant new addition to our knowledge base for Long-Range shooting. Hornady has released a new Ballistics Calculator that employs bullet profiles derived from Doppler radar testing and 3D projectile modeling. Hornady’s Patent Pending 4DOF™ Ballistic Calculator provides trajectory solutions based on projectile Drag Coefficient (not static G1/G7 ballistic coefficients) along with the exact physical modeling of projectiles and their mass and aerodynamic properties. This new 4DOF (Four Degrees of Freedom) calculator also accounts for spin drift and the subtle VERTICAL effects of crosswinds. “This calculator doesn’t utilize BCs (Ballistic Coefficients) like other calculators,” added Jayden Quinlan, Hornady Ballistics Engineer. “Why compare the flight of your bullet to a standard G1 or G7 projectile when you can use your own projectile as the standard?” That makes sense, but users must remember that Hornady’s 4DOF projectile “library” includes mostly Hornady-made bullets. However, in addition to Hornady bullets, the 4DOF Calculator currently does list seven Berger projectiles, six Sierra projectiles, and one Lapua bullet type. For example, Sierra’s new 183gr 7mm MatchKing is listed, as is Berger’s 105gr 6mm Hybrid. The Hornady 4DOF Ballistic Calculator provides trajectory solutions based on projectile Drag Coefficient (not ballistic coefficients) along with exact physical modeling of the projectile and its mass and aerodynamic properties. Additionally, it calculates the vertical shift a bullet experiences as it encounters a crosswind, i.e. “aerodynamic jump”. The use of drag coefficients, projectile dynamics, aerodynamic jump, and spin drift enable the 4DOF Ballistic Calculator to accurately measure trajectories even at extreme ranges. It is ideal for both long range and moderate distances and is available for the low-drag precision bullets listed in the drop down menu of the calculator. For calculating trajectories of traditional hunting and varmint bullets using BCs (ballistic coefficients), you can use Hornady’s Standard Ballistics Calculator. 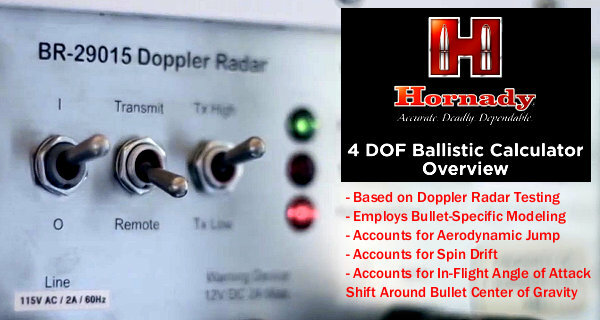 Share the post "New Hornady Ballistics Calculator Uses Doppler Radar Bullet Data"